I have been coordinating weddings since 1999. I have been an officiant since 2005. How many weddings do you perform in a year? I coordinate 9-12 events in a year. I like to keep things personal. In 2017, I performed 190+ wedding ceremonies. As an officiant - YES - since I'm short, sweet and simple. As a ceremony coordinator - NO - that's just CRAZY!! No; I am a firm believer in team work to create a seamless event. 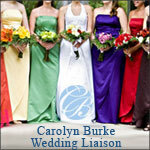 A collective group of industry professionals is what creates a memorable and stress-free wedding. No, I only COORDINATE weddings, PERFORM CEREMONIES and offer a DELUXE ELOPEMENT.